Since 1992 and to the present day the Private Finance Initiative (“PFI”) has been used to finance and operate public sector projects. Under PFI, the Government takes out a loan through a private company (a “PFI Company”) who then build and manage a project. The PFI Company then charges the public sector a repayment fee each year for the loan and any services they provide. There are now 700 PFI projects around the UK including for schools, hospitals, prisons and motorways. There is now a compelling body of evidence that the costs of these deals outweigh the benefits- with £200bn due back to these companies over the coming years for £60bn worth of buildings, PFI is the equivalent of taking out a payday loan to pay for building and running our public services. The annual charges for these deals amounted to £10.3bn in 2016-17 – with around half of this cost being for interest repayments and charges rather than services for local residents. Recent research by the National Audit Office (NAO) shows that using PFI contracts can make the costs of public building projects 40% more than relying solely upon government money. It also shows how additional charges such as insurance and cash requirements have pushed up these costs further. The NAO also highlight that the 2012 Conservative Government review of PFI failed to address any of the concerns about the costs of borrowing or overcharging by these companies. A recent Independent think tank report by the Centre for Health and the Public Interest found that over the past 6 years PFI companies made pre-tax profits of £831m in the NHS alone and are estimated to make profits of almost £1bn over the next 5 years. The collapse of Carillion also shows that those who argued working with the public sector would transfer the risks of building projects to the private sector were mistaken. It is likely the bill to the public sector for addressing the consequences of Carillion’s poor financial management will run into hundreds of millions. The Government cannot guarantee what will happen to the PFI run schools and hospitals Carillion manages, as the contracts ensure that the lenders are given priority when it comes to repayments. To pay them these projects could be sold onto other companies who may seek to cut services or raise charges in order to continue managing them. At present no central record exists of repayments on these deals, with different Government departments each individually managing these contracts. Despite the Department of Health being aware of Carillion’s financial difficulties in June 2017 and the issuing of profit warnings, the Department for Transport awarded them lucrative HS2 contracts in July 2017. CAN’T WE JUST CANCEL THE LOT?! The NAO report also shows how expensive it would to cancel these contracts and bring the existing deals in house. This is due to the clauses in the contracts which require the lenders and the shareholders to be ‘fully compensated’ if they are cancelled. The contracts also require the Government to cover the interest rate swaps used to ensure that these deals were profitable. The NAO estimate this would add a further 23% to the costs of buying out these contracts. In total it could cost upto £220bn – money which would not go into our public services but back to these multi billion pound companies and their shareholders. Governments of all political parties- including Labour, Conservative and SNP have used these contracts, but it’s only Labour activists who have a clear plan to address the problems they cause. Labour can lead the call to get cashback from these companies through a windfall tax. We must fight to ensure not a penny more goes to them and their lawyers and to protect our public services from the damage these contracts have done. the consequences to public service budgets and provision of the use of these forms of finance including the remaining £200bn committed to paying these contracts and the evidence that approximately half of all repayments to these companies is for interest and charges not services provided. the small number of companies involved in this industry and the large profits they have been able to pay shareholders. Please share the #pfiddle materials online – you can find quotes, articles and pictures to help raise awareness of this campaign on this hashtag on social media. Please also use this hashtag when writing about this campaign online. Parliament will have the opportunity to show support for a windfall tax on PFI companies profits by voting for amendments to financial legislation. Please ask your MP to co-sign these amendments and vote for them to show that if the Government doesn’t step into sort out the PFI contracts, Parliament will legislate. What is the basis for imposing a windfall tax on PFI operators? The NHS is currently in the most austere decade of funding growth in its 69-year history and is facing an unprecedented funding gap of up to £34bn over the 5-year period to 2020/21. With planners facing the unenviable task of rationing care, questions have been raised about areas of NHS funding where savings could be made without affecting patient care. A recent CHPI report found that over the past 6 years PFI companies made pre-tax profits of £831m and are estimated to make profits of almost £1bn over the next 5 years. This led to calls for a windfall tax to be levied on PFI operators. In theory a windfall tax could be levied to recoup some of the excess gains made by PFI operating companies (SPVs) with NHS or social care contracts. The tax could be raised from gains arising from the fall in the corporation tax rate from 30% (FY07/08) to 20% (FY15/16), and down to 17% by April 2020. When PFI deals were designed and negotiated they included an expected rate of return for the investors along with agreed payments over the lifetime of the contract (on average 27 years for health contracts). These contracts offered a relatively secure rate of return for the PFI investors, many of whom sub-contracted any maintenance work and explicitly removed the financial risks associate with inflation and changes in interest rates. One of the modelled costs in the contract was the expected corporation tax rate that would be paid by the investors. The majority (92%) of NHS and social care PFI contracts were agreed and signed before the reduction in corporation tax (standard) rates in 2008/09 from 30% (see figure 1 below) and so their models reflect this higher rate. Source: HM Treasury. Private Finance Initiative and Private Finance 2 projects: 2016 summary data. For every £100m of pre-tax profit that is made they will now in 2021 receive £83m of post-tax profit instead of the expected £70m at the original tax rates. This is a huge increase in returns and a windfall. Consecutive falls in corporation tax rates since 2008/09 have provided an additional and unexpected increase in financial returns for PFI operators. Is this an issue? Most operators outsource all maintenance and facilities management to sub-contractors. Any tax cut to the PFI company itself will not incentivise their sub-contractors to provide new investment or a better quality of service. Given these features, enabling PFI operators to benefit from a lower corporation tax rate seems unnecessarily generous especially when the NHS, and wider public services, are undergoing conditions of austerity. Moreover, levying a windfall tax that recouped the monies saved since 2008/09 wouldn’t distort the economic activity of PFI operators because the long-term contracts they signed anticipated a given rate of return which would have expected the tax savings they have since experienced. HOW MUCH HAVE PFI OPERATING COMPANIES SAVED SO FAR? Without access to each company’s corporation tax return a precise overall figure cannot be supplied. However a good estimate can be made by looking at the corporation tax charge (in their published accounts) in each year from 2008 (when corporation tax rates dropped from 30%) and comparing it to the estimated corporation tax charge if tax rates had stayed at 30%. In Table 1, the £84m estimated tax saving represents 9% of Profit Before Tax (PBT) for the period and represents a 42% increase on the actual tax charge. PFI contracts are modelled to make low profits/losses in the early years of the contract (where they pay down their loans to banks and shareholders) and become increasingly profitable in later years, as the example in Figure 3 shows. 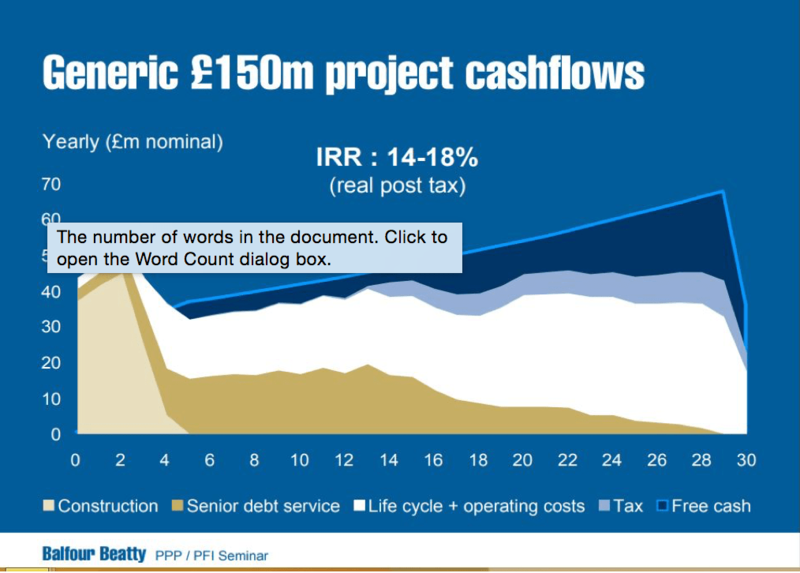 Source: Balfour Beatty, PPP/PFI Seminar. London, June 2003. Using data collected from a previous CHPI paper, and forecasting profits into the future, Table 2 forecasts the future savings made from falling tax rates over the years from 2016 to 2020. The £106m estimated tax saving represents 11% of PBT for the period and is 60% higher than the forecast tax charge at the lower tax rates. The analysis shows that there is a case for levying a windfall tax on PFI operators in a way that does not impact their expected returns or patient care services. Whilst an £84m saving now, and £106m of savings over 5 years, is small compared to the financial challenges facing the NHS, the tax would bring in increasing revenues over time. This would be due to profitability improving (in line with the financial model) and tax rates falling over time making the gap between the estimated tax take at 30% and the actual tax paid widen. Moreover, this windfall tax could be applied across other sectors outside health. According to Treasury figures 450 of the 589 PFI schemes (across all sectors excluding health) reached financial close before the fall in corporation tax rates from 30%. This article was originally published by the Guardian newspaper on Wednesday August 30th 2017. This report looks at how much profit has been generated by the private companies owning and operating NHS hospitals and other facilities under the Private Finance Initiative over the past 6 years, and the impact of this on NHS finances at a time of severe funding shortfalls. The Private Finance Initiative is a scheme whereby private companies borrow money from banks and shareholders to build NHS hospitals and facilities. The NHS pays an annual charge to the PFI companies partly for use and maintenance of the hospitals but also to pay back the money, and interest, the private companies have borrowed. The contracts with the PFI companies can last for up to 40 years. This means that the NHS is legally committed to paying an annual charge to the private companies running these hospitals for the foreseeable future.It identifies for the first time the amount of taxpayers’ money which has been transferred to the profits of PFI companies. Over the past 6 years (between 2010 and 2015) the NHS and local authorities in England have spent a total of £10.7bn on hospitals and other healthcare facilities built under the Private Finance Initiative. There are currently 125 PFI contracts with private companies overseen by the Department of Health. The capital value of the assets which have been built is £12.4bn. However, over the course of the life of the contracts, the NHS will pay in the region of £80.8bn to PFI companies for the use of these assets. Just 8 companies have equity stakes in 115 or 92% of the 125 Department of Health PFI schemes. This raises concerns over how competitive any future rounds of PFI tendering can be, and over the potential for the abuse of market power resulting from existing contracts. The PFI companies which hold the NHS hospital contracts have made £831m in pre-tax profit over the past 6 years. This profit is in addition to the profits made by the banks on the loans they have made for the building work, by the construction companies which built the hospitals, and by the companies which provide maintenance and other services for the hospital buildings. The PFI companies whose profits are the subject of this report employ only a handful of people whose main role is to receive and allocate the income from the NHS paid by the hospital trusts. This means that around 8% of all the money which the NHS has paid to these companies over the course of these 6 years has left the NHS in the form of pre-tax profit and is not available for patient care. These contracts generated £480m of dividends which were paid out to those who had invested in the companies, equivalent to almost 5% of all the money the NHS has paid. The returns expected by those investing in and lending to PFI projects are also far higher than they would get if they invested elsewhere, even though they are very low-risk, because the government guarantees that the payments will be made so long as the hospital is available for use and the services meet the standard set out in the contract. The cumulative deficit of all NHS hospitals over the period covered by this study was £3.4 billion. The impact of this underfunding would have been reduced by just under a quarter if the £831m in pre-tax profits made by PFI companies had instead gone to fund patient care. The government has increased the amount to be given to the Department of Health by £4.5bn in real terms between 2015 and 2020/21. If the PFI companies continue to accrue profit at the same rate as in 2015 – (i.e. at an average of 9.4%) they will earn around £973m in real pre-tax profit. This will means that the equivalent of 22% of the new money for the NHS will be potentially paid to private companies in the form of pre-tax profit – almost £1bn that would otherwise be available for patient care over the next 5 years. In order to ensure that the best use is made of scarce public funds to care for patients at a time of extreme austerity the NHS and the government should look at ways to curtail excessive profit-making from Private Finance Initiative contracts. re-negotiate the contracts with the PFI companies to reduce the amount that the NHS pays. Finally, as we have noted in a previous report, the government should reconsider its use of the Private Finance Initiative and consider using public borrowing to fund new capital investment in hospitals. This is likely to be much cheaper and will mean that less money for patient care will be wasted in payments to shareholders, which is particularly important when the NHS is going through the most austere decade in its history. The case against PFI grows stronger as the repayment costs rise, NHS finances deteriorate, and international interest rates fall. There is an alternative. PFI is sometimes seen as yesterday’s battle. For over 20 years, capital funding for major public service schemes has been available predominantly only through PFI. Contracts have been tendered, partners selected, and the schools, hospitals, and prisons built. Even many on the left now view PFI as a given. Passim Allyson Pollock’s and John Lister’s excellent work on this subject, what is left to say? The most recent data for NHS PFI schemes should remind us why PFI matters now more than ever. The most recent figures reveal that the bill for private finance initiative hospitals reached £2bn in 2015/16. Moreover, tapering of the repayments, the lowering of repayments in the first years of a contract and raising them in subsequent years, and the indexation of payments linking them to inflation, mean that for hospitals with a PFI scheme the full revenue consequences will not be realised for years. Indeed, repayments are not projected to peak until 2028-29. Figure One, below, illustrates the impact on individual Trusts. Central Manchester NHS Trust paid £72.4m last year and Bart’s £127m for the pleasure of their new facilities. Bart’s currently runs a budget deficit of £134m. Central Manchester’s repayments are 10% of its annual clinical revenue. The sum of these ongoing revenue costs to the NHS is often dismissed given the scale of the current financial problems but they are a massive drain on the NHS. Significantly, these costs are greater than the government is promising to the NHS in future financial settlements. This funding could provide a vital lifeline for the NHS, preserving and protecting vital services whilst giving it the breathing space to transform and improve current services. Unpersuaded? Then consider the value for money that PFI has delivered in the NHS. Government reports state that the capital value of the 105 NHS assets procured through PFI is some £11.8bn, for which the NHS will pay some £79bn over 31 years, (£4000 per household in the UK), of which £64bn is still outstanding. This is equivalent to a 30-year compound interest rate of 6.4%. Again, to illustrate, what this means to a Trust like Central Manchester is that it will eventually pay over £3.3bn for an asset that is currently worth only £512m. The rebuild of Bart’s is valued at £1.1bn but, under the terms of the PFI, the final bill to the Trust will be more than £7bn, with the Trust making payments until 2049 (Figure One). The view I often hear is that there is no alternative to PFI. This was not true in 1992, when the policy was implemented, and is not true now. Interest rates, the price paid for a loan, are fundamentally a measure of risk: it is an economic reality that governments can always borrow more cheaply than private firms, even sovereign equity funds. The implied interest rate for government borrowing was around 3% in 2013/14 whereas PFI rates of return are over 6%. The decision not to fund hospitals through government borrowing was always a political, not an economic one. And if you still need convincing, since 2008 the world economic situation has changed drastically: when banks in other countries, such as Japan, will now pay you to take their money (through negative interest rates), it is fiscal madness not to take advantage of this. There is a way out of PFI contracts. Contracts can be terminated and compensation paid. An example of this is Northumbria Healthcare NHS Foundation Trust which terminated its PFI deal, for which the Trust paid £24m in costs and a further £4m in compensation. Despite these costs, the foundation trust was still able to obtain savings of over £67m from ending the PFI contract early. The Scottish Parliament, it worth noting has already decided to dispense with PFI. PFI is a triumph of dogma and ideology over reason; there is an alternative though – there always has been. New Propco – Opportunity or Threat? The Department of Health (DH) is to create a new property company to replace the two that currently exist1 nearly four years after the intention was first announced. The move is understood to be one of the recommendations of Sir Robert Naylor’s forthcoming report on the NHS estate. The current position came into being as an afterthought to the now much derided Health and Social Care Act 2012 “reforms”, with a new DH owned company, Propco, solving the problem of who took over billions of pounds of property (such as primary care centres, clinics, community hospitals and offices) after Primary Care Trusts (PCTs) were abolished. When Propco was set up there were concerns and issues and the suspicion that this was just a vehicle for privatisation or an asset sell off. Many of the properties were occupied wholly or in part by non-NHS bodies. Social enterprises (largely formed by former NHS community services staff) raised concerns that the change would add further complexity to the management of the estate, stalling the ongoing rationalization of existing property assets. They noted that new leases would have to be prepared with additional expense and management arrangements would become more complicated having overall a destabilising effect on local health economies. Propco became NHS Property Services and its recent decision to move to market rents has caused a lot of problems. In July last year it was reported that commissioners remain locked in protracted negotiations around how much they will pay for buildings rented off NHS Property Services because of data problems. A senior Clinical Commissioning Group (CCG) finance officer told HSJ the principle of the move was understandable, but raised concerns that the implementation was being “botched”. NHS England director of financial control Steve Wilson informed CCG finance directors in a letter dated 15 June that there had been “a number of data quality issues” with NHS Property Service’s data highlighting earlier concerns that the setup of Propco had been compromised2. For me locally there are problems with Health Centres facing extra charges and a community based organisation, born out of the Local Authority and NHS working together, suddenly being asked to pay huge increases in rents and charges; which I have taken up on their behalf. But my wider concern is about the aims and objectives of the new property services company. Is this incarnation an attempt to be supportive of the NHS and its Sustainability and Transformation Plans (STPs)? These STPs are the great hope for our NHS, implementing the Five Year Forward View. Or is this new company just a route to a sell off more of the extensive NHS estate; or is it an income generator getting in the rents and charges. And why not bring in all NHS properties and include management of the many large PFIs (maybe better expertise could renegotiate better deals)? This confusion about aims and objectives was highlighted when the original Propco was set up. In its March 2014 Report, Investigation into NHS Property Services, the National Audit Office pointed out that the objective “to hold property for use by community and primary care services AND deliver value for money” (emphasis added) was not clear. This is important because just about every STP has pointed to estates as one of 3 or 4 key enablers of change. So does Newpropco have the role of facilitating these STP changes, or is it about maximizing income or receipts? Are decisions to be made locally, or by Newpropco, or through joint working? How will Newpropco staff be expected to work with localities – at present there is little or no local presence or knowledge. So far the objectives of Newpropco have not been published but a DH spokesperson has said “The ability to invest in the highest standards of patient care, delivered in the right buildings and facilities, is a priority for this government. The creation of a new NHS property organisation will help to identify unused property to generate funding for reinvestment in the NHS whilst driving down estate running costs and creating opportunities to deliver new homes across the country.” Very laudable but not very specific on how potentially competing aims are balanced. To add confusion last October, Simon Stevens the Chief Executive of NHS England told HSJ that NHS England was exploring the possibility of NHS organisations keeping their land sale receipts to invest in new services, rather than surrender them to central government. This tension between running a property company and managing properties on behalf of the best interests of the operation of the care system is probably not resolvable. I await with interest what Ministers will say about the setup of Newpropco and the Naylor Report when we see it. We must all hope this venture goes a lot more smoothly and with a much clearer strategy than the last attempt. It would also help if it operated in a more open and transparent manner like the NHS is supposed to be and not behaving like a commercial company in disguise. 1 NHS Property Services (Propco) was set up in 2012 to take over the ownership and management of property previously owned by organisations, such as primary care trusts, which were abolished by Health and Social Care Act reforms. It runs 3,500 properties, including offices, primary care and community health facilities. Community Health Partnerships (CHP) was established in 2001 to manage the DH’s interests in local improvement finance trust companies. LIFT is a scheme for public-private community property developments. 2 This is acknowledged now as many tenants have no proper leases or even agreements of any kind to cover rent and charges. Information was never properly collected on start up. No matter who wins the General Election, the next government will have to deal with the growing cost of inflexible PFI contracts. Those contracts make the task of balancing the books much more difficult. Under the Private Finance Initiative (PFI), the private sector designs, builds and finances much needed new hospitals, schools, roads, prisons and other social and public infrastructure. It also provides the ancillary services – such as cleaning and security, but not the core professional services such as nursing – for typically 15 to 35 years, in return for an annual fee that covers both the capital cost of the asset and the service delivery. In most cases, the public authority pays on behalf of the ultimate user. PFI was started by the Conservative government in the early 1990s – and the policy was enthusiastically extended by the subsequent Labour government. Currently there are around 700 PFI projects in operation in the UK with a total capital investment to date of around £56bn. Annual expenditure on PFI contracts has risen to £10bn per year – there is a future total commitment of £222bn in the years to 2050. Until the 1980s, annual private finance investment represented only 10% or less of total annual public sector capital investment. Yet the last government’s National Infrastructure Plan indicated that in future around 80% of new economic infrastructure will be at least partly privately financed. But what is particularly significant is that PFI contracts changed how public sector revenue budgets are spent, not just in the years in which the contracts were agreed, but also for many years into the future. PFI contracts will consequently limit the levels of flexibility available to governments throughout the first half of this century. Firstly, although the rhetoric stated that PFI would offer value for money by delivering projects more cheaply and efficiently than the public sector, there is little evidence to prove that this is the case in practice. Rather, the evidence that does exist points to contracts being more expensive. This is not surprising given that the government has to pay for higher finance charges – the private sector cannot borrow money as cheaply as government does – and the private sector has to build in a profit element. In addition, the private sector typically adopts very complicated organisational structures for PFI contract delivery through which profits are distributed via complex chains of sub-contracting to sister companies. Secondly, the PFI contract is used as the main mechanism for managing a project. These contracts are very lengthy legal documents, which set out how payments will be made and when and how penalty deductions for poor performance can be applied. Any change to a contract results in a costed amendment – in one instance with a hospital PFI we found that adding the cost of marmalade to patients’ breakfasts added an additional £40,000 per year to the contract price. By contrast, penalty deductions for poor performance are difficult to agree on and typically amount to small figures. Monitoring tends to be weakly enforced, so the public sector is vulnerable to paying the full price while receiving poor quality performance. Furthermore, most contracts are subject to upwards financial reviews against a stated benchmark every five to seven years. Over time, therefore, annual PFI charges are increasing higher than the original contract cost, whilst public sector budgets are being squeezed. This situation has created an affordability crisis. In an ironic turnaround, although the PFI policy promised a reduction in risk to the public sector by claiming risks would transfer to the private sector, I would argue that risks to the public sector have instead increased due to the need to divert public funds from other budget areas to pay for PFI contracts. Thus other services are put at risk. This crisis is most evident in hospitals. Last year the foundation trust running Hexham General Hospital bought itself out of its PFI contract, thereby saving £3.5m a year. But it cost £53m to break the contract – for a contract that contained an original capital element of £54m – and the trust had to borrow money from the local authority to pay for it. This is not something that most cash-strapped health trusts can afford. Instead they have to resort to mergers between trusts and the cutting of clinical costs in order to pay for PFI contracts. But these measures are unlikely to solve the problem of increasing deficits caused by unaffordable PFI contracts. Barts Health NHS Trust, which has the largest hospital PFI in the country at a capital value of £1.1bn, has had to cut clinical costs across its hospitals. It reported a deficit of £38m in 2013/14, which is set to rise to £44m for 2014/15. The trust was placed in special measures in March due to concerns over the standards of care in one of its (non-PFI) hospitals. Standards of care are bound to suffer when savings of this scale are required. Attempts made so far to amend contracts and cut costs have yielded little results. The next government of any complexion must work much harder to tackle the problem of how to make these unaffordable and inflexible projects more affordable. Not to do so would make a nonsense of pursuing austerity policies elsewhere. The Private Finance Initiative is in the news again as Barts with a huge PFI hits financial trouble. The total cost of all PFI schemes in the NHS is £2bn. Around £1bn of that is payments for facilities management services. The total expenditure of the NHS is £110bn. If all PFIs were somehow “nationalised” there would still be facilities management costs, repairs and renewals but perhaps they could be provided in house less expensively. So perhaps £1.3bn could be “saved”. The possibility of simply nationalising all the PFIs is remote (to say the least) – it would require all kinds of legislative change and possibly even exit from the EU. Anyway it is not politically doable any time soon. So the recourse is to renegotiate, something that has been done with PFIs outside the NHS with some success. There is some vague idea of “fair value” which is the amount that would have to be paid if the PFI schemes had not been used and the normal public sector approach adopted. This approach has been used in the NHS in order to calculate a subsidy which is being paid to some Trusts which have significant problems (the balance is met out of central funds so still a charge on the NHS as a whole). But if all PFIs could be renegotiated back down to “fair value” and the facilities management aspects also bargained down to a better deal then savings of the order of hundreds of millions could potentially be made. That is say £500m out of £110bn or about 0.5%. Worthwhile but actually small even in relation to the current immediate funding gap in the care system of perhaps £3bn – £5bn and growing. Even to achieve these savings would require the kind of negotiating skills that are notably absent in the NHS. But the policy of first centralising the PFI debts and managing the renegotiations centrally then levying a fair charge on the Trusts is logical. For a small number of Trusts, like the appalling scheme at Peterborough and Stamford, PFI is a major issue. But it is easy to distort the impact of PFI on the NHS as a whole and to exaggerate the potential for savings. There are many more pressing and more significant issues to resolve. In fact little of any value has been said about PFI since 2001 with Jon Sussex’s paper for the Office of Health Economics “ – The Economics of the PFI Initiative in the NHS”, although John Lister’s work for Unison also provides many valuable insights and facts. You’d never be able to tell from the outside, but hundreds of our hospitals, schools, prisons roads and even homes are no longer controlled by us, the people. Why? Because politicians have given away our public buildings to private companies – only to have us rent them back at extortionate cost. Our money is making these tax-avoiding corporations rich, while we end up losing frontline services. This is what they mean by the Private Finance Initiative (PFI). Every year PFI costs us £10 billion – more than the entire 2012 Olympics! The UK taxpayer will pay almost £300bn for PFI – but most of that will end up in offshore tax-havens. The government and private contractors consistently conceal details of PFI contracts. Why should public spending be allowed to be kept secret? The worst part of it all is that the public were given no choice about PFI. PFI was implemented by a corruption of the democratic process. We need to take back our rights. There is an alternative – there are cheaper and better ways to provide public infrastructure. It’s time for us to stand up and say NO to the politicians and private contractors that want privatisation-by-stealth. It’s time to make public services ours again. Join public sector workers, professional groups, trade unionists, campaigners, researchers, journalists and members of the public for a two-day event to launch this vital campaign to end PFI. Hear from experts in the field to learn how you can make a difference, and tell your own story about how PFI is harming you, your family and your country. Private Finance Initiatives – What Now? We need to be critical of the original and Mark 2 Private Finance Initiatives, especially in individual cases for the reasons which have been rehearsed where projected demand has not come through and commercial arrangements were not agreed in the interests of the NHS. Executive Directors still in post (not many) feel this way. There is experience of a large Trust which now has an affordable PFI – 2 brand new hospitals replacing 19th century and a terrible 1950s building for which there was not an available state capital solution. It was changed at the last minute to increase bed numbers in order to satisfy political requirements that the net position in beds should be no lower than those being closed. The circumstances where PFI could work are where the NHS could get the benefits of earlier “ownership” in terms of opportunities which arise during the period of the PFI. PFIs are normally built on time because it costs money to change plans – there are penalties every time plans are changed and are therefore kept them to a minimum. State-funded capital schemes have a long history of going over cost and being late. The risk private funders were taking was whether the revenue would flow to pay for their release of capital and the judgement they made to compare with what else they could do with it. Some Trusts made money when ownership of the PFI changed hands which was used to fund NHS services. – this may be difficult to cope with, but building PFIs in crowded hospital markets has driven changes which normally take 20 years to achieve – given the love we all have for local bricks and mortar and the delay promoted by political opposition from all parties. In other words, unaffordable PFI has driven closures to make them affordable (this is also true of state capital funded schemes which mean there is no spare cash to sort out neighbouring NHS facilities). – we need to treat “Exchequer” capital properly, not just as a lump sum with a one-off value. Given we have a deficit, state capital needs to be borrowed (with a cost) and has an opportunity cost (ie what else could be done with it for a higher economic return). – most PFIs include a “service” element, at the extreme this includes support services, estate management, and keeping facilities in good nick (with the ultimate benefit that the capital is the property of the NHS at the end of the period). For me, the best value option (if we can’t have state capital – at the expense of revenue funding) is for joint ventures, where the NHS shares ownership and brings in private capital on equal terms. One of the big problems with original PFI was that a special economic vehicle was set up without NHS (Trust) participation which created a blockage between the NHS user and the building management. The opportunity to influence building management and to re-tender before the end of term (which could include in-house solutions) for the service element has been restricted.